There is no better way to explore the range of exceptional products from Don Juan Pomade than to grab the Don Juan Pomade Supreme Royal Kit. This travel-friendly kit comes with everything that you need in order to look great and feel fresh. Whether you’re on the road or grooming in your own home, this kit is a must-have for anyone who cares about the health of their hair, face, and beard. The Don Juan Pomade Supreme Royal Kit takes care of all of your grooming needs by providing you with 5 essential products that can be kept in your shaving drawer or brought with you when you travel. 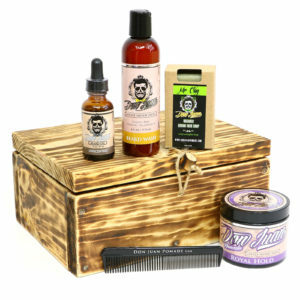 This kit contains the Don Juan Beard Wash, the Don Juan Unscented Beard Oil, the Don Juan Mr. Clay Organic Beard Face Soap, the Don Juan Royal Hold Medium Shine Pomade, and the Don Juan Style Never Dies Comb. What more could you ask for? All of the products that come with the Don Juan Pomade Supreme Royal Kit contain only organic, natural ingredients that nourish your hair, face and beard without any harsh sulfates, cheap filler chemicals or synthetic additives. As a result, your grooming session will leave you feeling clean and refreshed like never before. Whether you have sensitive skin or just prefer a natural lifestyle, this kit doesn’t disappoint. The Don Juan Beard Wash and Don Juan Unscented Beard Oil provide your face and beard with valuable nutrients that are derived from organic ingredients like jojoba oil, plant-derived squalane, licorice root and argan oil. Meanwhile, essential oils like rosemary, peppermint and lavender stimulate the growth of thick, healthy hair while keeping your skin clean like you’ve never seen. The Don Juan Mr. Clay Organic Beard Face Soap is free of parabens and harsh chemicals, giving it the ability to thoroughly cleanse your skin without leaving it feeling dry and tight. The high-quality French green clay acts as a magnet, drawing out dirt, oil and toxins from your skin. The Royal Hold Medium Shine Pomade gives your hair a healthy sheen while nourishing each strand on a deep level. It provides a medium hold that’s great for everyday styling. The tropical lavender scent is derived from botanical extracts and essential oils, allowing your hair to smell great. Creating the perfect style is a breeze thanks to the Don Juan Style Never Dies Comb that’s included. The Don Juan Pomade Supreme Royal Kit arrives in a special wooden box that’s perfect for grooming away from home. If you care about looking good and using only the best ingredients for your skin, beard and hair, you can’t go wrong with the Don Juan Pomade Supreme Royal Kit.